Gionee mobile is a well known brand in China and recently they put out the flash on their new iconic flagship Android smartphone called Gionee ELIFE E6. The device holds on to a retina display and its design is really impressive. No doubt, the company will sell it out at much competent price but right now it’ll be available only in China. Gionee seeks availability of the device in India and few other countries in the month of October, 2013. I’ll love to start with the design as every user is going to accept the device in terms of design. Sony smartphones usually have such box like design but Gionee developers have managed to put on an new design inspired by Sony ones. As the brand said that the device is having Retina display so the design of the device should have been good and so it is. Right now it’s launched in black and white colors. Also the thickness is only 7.7mm which makes me feel further excited to have a look at the device as soon as it’s available. I’m completely happy with the design of this device. The display measures 5 inch diagonally and it got full HD resolution to further impress the users. The pixel density in ppi is also impressive, near to 441 which makes it count as a Retina display. According to the Gionee, the display provides razor sharp images and the viewing angles in the sunlight are good. The use of such technology in the display has allowed them to increase the sharpness by 20% (sounds good). The processor inside is the Cortex A7 Quad core one having clock speed of 1.5GHz. There is 2GB of RAM inside and 32GB of internal storage. There is no slot for expandable storage and I didn’t found any word on whether the device is having GPU or not. Still the processor is good in specs, let see how it works in reality. The rear camera got 13MP shooter powered by Backside Illumination technology (2nd generation) and it will be capable of recording full HD quality videos and very sharp high quality images (I want to see samples taken in low light). There is smile detection, face detection, HDR, panorama and object set auto focus. The front shooter got 5MP sensor which is really good as the video quality during video chatting will be better than any other smartphone available till now. Off course, it runs on Android and the version is 4.2 Jelly Bean. The device got a feature by which users just have to put the device up to their ears and the incoming phone call will be answered (feature also there in Micromax Canvas 4). Similarly outgoing phone calls can also be done. There is also some gesture control tweaks in the device indicating towards better user experience. It is compatible with 3G cellular network and other data connectivity tools are Wi-Fi, Bluetooth 4.0, GPS and microUSB port. The Gionee ELIFE E6 has got 2020mAh battery which is non-removable. Until the specifications of Gionee ELIFE E6 are concerned, the device is looking really up to the mark but let see how it performs in its benchmarks. 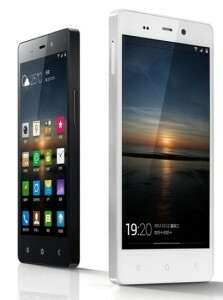 Gionee Launched Elife E6 officially in india on 3rd October for Rs. 22,999.